Following the success of the previous EpiCypher meetings, we’re pleased to announce this year’s meeting by one of our partners EpiCypher. EpiCypher2018: Biological and Clinical Frontiers in Epigenetics will feature keynote addresses by Dr. C. David Allis and Dr. Kristian Helin. Dr. Allis is the Joy and Jack Fishman Professor and Head of the Laboratory of Chromatin Biology and Epigenetics at The Rockefeller University. Dr. Helin is a Professor at the University of Copenhagen and the director of the Danish National Research Foundation’s Centre for Epigenetics. The plenary session talks will cover broad aspects of epigenetics and chromatin biology, ranging from basic molecular mechanisms to therapeutic efforts. There will be discussions around the elucidation of novel mechanisms, new tools, and other breaking topics in epigenetics and chromatin research. Learn more about the meeting – download the flyer here. As mentioned in a previous post the DAX Biochips from AIM Biotech are an innovative and versatile microfluidic platform, allowing researchers to more easily develop 3D cell culture models, to work as close as possible to what occurs in the human body, but under in-vitro conditions. Due to its innovative structure (as seen in this general AIM Chips flyer), a broad range of applications have already been validated on this model (Cellular Migration-Invasion Analysis / Angiogenesis studies / Metstasis Modeling System), but what’s new is that now Immunotherapy and T-Cell Therapy studies can be performed on this technology. Nipah Virus Infection (NiV) is an emerging infectious disease of public health importance in the South-East Asia Region (source: World Health Organization). Along with Hendra virus (HeV), NiV is part of a new genus designated Henipavirus. Fruit bats have been identified as the natural reservoirs. Nevertheless, pigs, horses, goats, sheep, cats and dogs can also be infected and transmit the virus. Released by the kidneys, Renin is an enzyme which belongs to the Renin-Angiotensin system (RAS) and is involved in blood pressure homeostasis. In healthcare, Renin assay blood tests can be performed to find the cause of high blood pressure (hypertension). When tested alongside with Aldosterone measurements, one can obtain a complete understanding of an individual’s hormone balance. Enteroviruses are common human viruses causing rather mild symptoms. However many different species and serotypes (incl. Echoviruses, Polioviruses, Coxsackieviruses A and B) can cause serious illness (like EV71 & Coxsackie A16 with Hand Foot and Mouth Disease or EV70 with acute haemorrhagic conjunctivitis, neurologic dysfunction and permanent polio-like paralysis). In this brief post, you will discover recent Antigen & Antibody developments made in this field by Meridian Life Sciences. RayBiotech 2017 Outstanding Distributor Award – tebu-bio Best in Europe. 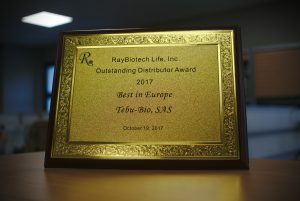 At the recent meeting of all RayBiotech distributors, Isabelle Nobiron PhD (Product Specialist, tebu-bio), was proud to receive the 2017 Outstanding Distributor Award – Best in Europe. During this meeting, which took place in Guangzhou (China), RayBiotech (Norcross, USA) also appointed tebu-bio as one of the 3 centers in the world to perform contract research for their high density arrays. Up to 1000 human proteins, 200 mouse and 67 rat biomarkers can be tested on semi-quantitative or quantitative proteomics microarray platforms. tebu-bio has been a longstanding, recognised RayBiotech Certified Services provider, performing outsourced immunoassays at their European Headquarters situated near Paris (full range of services tebu-bio services here). RayBiotech, Inc. develop cutting edge proteomics tools for the advancement of basic and clinical research, and the facilitation of drug and biomarker discovery. Their product-line covers 2,000+ rigorously tested ELISA tests (covered by a 90-day 100% satisfaction guarantee), Multiplex ELISA Arrays (Quantibody®), Membrane- or glass-slide Antibody Arrays (C-Series, G-Series, L-Series, E-Series), Functional assays, Research antibodies and Recombinant proteins. tebu-bio provides their broad range of products to researchers across Europe. For more details, contact your local tebu-bio office. Travel Grant Winners – where have they been to? 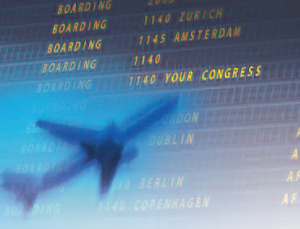 tebu-bio’s latest Travel Grant draw took place on June 16th, and saw six more researchers win 400 Euros each towards attending the meeting of their choice. Here’s some news from two of our previous winners (in October 2016 and February 2017), who were happy to share these pictures from the same meeting they both attended! Dr Giuliana Banche of the University of Torino (Italy) presenting her research. Beatriz Rojo of the CIBIR (Spain), presenting her research. Interested in winning 400 euros for your next meeting? tebu-bio’s fourth and final draw for 2017 will take place in October, applications are now open and can be uploaded online here. Travel Grant Winners, where have they been to?